Behold the new UR3 robotic arm. Smaller, lighter, and more nimble than its predecessors, the Universal Robot-built arm can be programmed for a wide variety of tasks — including the construction of its own parts. Based out of Odense, Denmark, Universal Robots has added UR3 to its impressive line of industrial robotic arms, which includes the larger UR5 and UR10. The company is hoping to attract small- and medium-sized businesses to its new offering, which will sell in the U.S. for $23,000. As reported in IEEE Spectrum, the highly flexible UR3 is a six-axis articulated arm that can perform a host of tasks, including pick-and-place, screwing, soldering, gluing, and painting. It does so in close collaboration with human workers, but it features some impressive autonomous capabilities, such as being able to "feel" its way across a surface, instead of having to be explicitly programmed to recognize the target topology. The company says the UR3 is particularly suited for "light assembly tasks and automated workbench scenarios" in a variety of industries. In fact, there's one application the new robot is already helping with: making copies of itself. 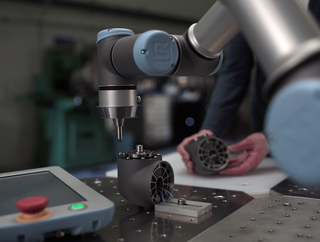 Universal Robots has provided robotic arms to several of its suppliers, with the arms helping human workers assemble components that will go into other arms, [Universal Robots CTO and co-founder Esben] Østergaard says. "Our robots are indeed helping to build our robots." Read the rest of Guizzo's post here.